William Earl Bergey is a former American collegiate and Professional Football player. 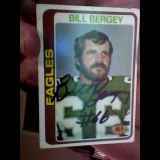 He played collegiately for Arkansas State University and for the American Football League's Cincinnati Bengals and the National Football League's Philadelphia Eagles. New Response (Success): photo n pc no pc back signed 4x6 and an 6x10 with ..